If the Surgery cannot offer you an appointment with a GP you may be offered an Extra Care Appointment. 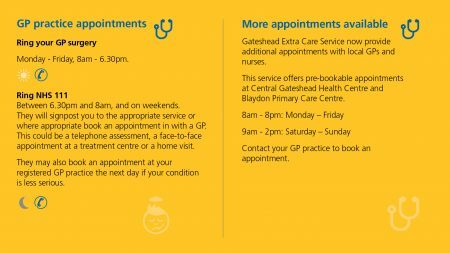 These appointments are at either Gateshead Health Centre based at Prince Consort Road or Blaydon Health Centre and are available to all patients registered with a Gateshead GP. Appointments are available at the Extra Care Service 7 days a week. Appointments must be booked in advance by the Surgery – Extra Care is NOT a Walk In Service.